A 2011 Keystone Outback Lite parked a few spaces down from us caught my eye, so we stopped to talk to the owners, Jimmy and Lorena, who were clearly in love with their new RV. More standard specifications can be viewed at Keystone Outback standards web page. What a beautiful travel trailer this is. Keystone focuses solely on travel trailers and fifth wheels, so they aren't trying to manage products in every possible niche in the RV industry. While there are several models, floor plans, and amenities to choose from, you can also have Keystone make personalized modifications when you place your order. This model should give you an idea what this manufacturer offers, however. The 312BH floorplan has the exterior kitchen that includes a 2-burner range, refrigerator, sink, and two cupboards. This is the perfect feature to keep the inside clean and avoid the accumulation of splattered grease, odors, and airborne grease that, over time, builds up on the interior walls and fixtures. It also eliminates any concerns you have about ventilation when using propane. This outside kitchen is the feature that won Lorena's heart. The extra refrigerator is a real bonus, whether to keep your drinks cool and handy when lounging outdoors or to store extra food. The Outback Super-Lite can sleep up to 10 people. Up front is a queen bed with wardrobes on either side. Dividing this from the central living space is a partial wall housing an entertainment center, built in swivel TV monitor, and cabinets. The HDTV turns 180°, so you can watch from the living area or from the master bedroom. There's plenty of open space with a couch and large dinette on a slideout facing a 3-burner stove, sink, oven, microwave, refrigerator, cupboards, and drawers on the opposite wall. Both the couch and dinette can be converted into beds to sleep four more people. A full bath with toilet, sink, and shower/tub that opens to both the inside and outside separates the central area from the sleep area at the back. This area sleeps four with a fold-out couch and trundle bed on a slideout, and a full-sized TV/entertainment center with plenty of storage that supports another single bunk. Prices for this model can run from $23,422 to $43,525, with most in the mid-low $30,000 range. But news from the forums suggests you can get the best price from Holman Wholesale RV, in Batavia, Ohio, who also delivers to your door. Aside from the light weight of the Outback Super-Lite 312BH your mileage will be determined by your tow vehicle. You can expect better mileage than with a heavier travel trailer. Like other Keystone travel trailers, this one is well constructed with good quality materials. You can see a full list of the Outback 312BH standard features, but remember that you can request upgrades and personalized modifications when you order yours. NHTSA campaign ID number 10V478000: some 2011 models equipped with Atwood 35 series range ovens. A potential exists for a small fracture within the line delivering gas to the oven cavity burner. Such a fracture may cause propane gas to leak. NHTSA campaign ID number 10v597000: some 2011 travel trailers equipped with 15" x 6" white spoke or modular design steel wheels with a six hole bolt pattern. Some of the wheels may have inadequate weld penetration between the outer ring and the center plate due to improper plate alignment. 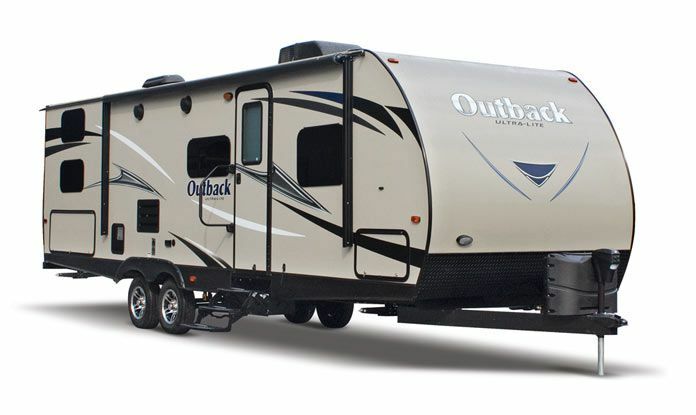 NHTSA campaign ID number 11v002000: Outback travel trailers equipped with Lippert component hitch couplers for lack of indentation on the forward edge of the coupler. The outside kitchen is a perfect touch for a travel trailer. Sleeping up to 10 people on so few square feet is pure genius. Keystone managed to include plenty of inside storage. The outside door to the bathroom is a very convenient touch if you spend your time outside your RV. Most comments on the Outback.com forum suggest that Keystone's customer service policies are satisfactory or better. Customer comments indicate few complaints about this model, and most of those are minor issues. Warranty issues have been honored quickly. The Keystone Outback Super-Lite 312BH includes air mattresses, but these are not that comfortable, and noisy to inflate. The outside grill gets very hot when using a larger skillet on the burners. This can cause the knobs to get too hot to touch, as well as some blistering of the plate that's mounted beneath the knobs. There's no air conditioner vent in the bathroom, so it's warmer air can be felt coming from under the door. The only thing Jimmy would like to see improved is to have more outside storage. When traveling, they use the bathroom for their chairs and other outside storage needs. Outbackers.com hosts an Outback owners forum where you can post questions and get answers. Learn about issues affecting your Outback, events, recalls, new models, service and warranty issues, campgrounds, rallies and get-togethers, aftermarket modifications and much more. Like most 312BH owners, Jimmy and Lorena are more than happy with their Outback Super-Lite. The only standard equipment they changed was the queen mattress, replacing it with one of a more personal liking. While they've had to have a few minor repairs made, these were done quickly and under warranty with no questions asked. They're planning many years of camping experiences with their kids and, one day, may join the ranks of us full-timers.